Chia is especially rich in essential fatty acids. One 15gm serving provides more than 3 gm of Omega3 (as alpha-linolenic acid) and 1 gm of Omega6 (linoleic acid) in a perfectly balanced 3:1 ratio. Several studies indicate a 3:1 ratio to be ideal, so always look for this. The unique texture of mixed Chia seed is a feature of its high fiber content and water binding capacity. For maximum benefit, drink at least 64 oz. of pure water every day. Omega3 Chia seed can be added to many foods including cereal, soup, salad, yogurt, smoothies and baked goods. One tsp. 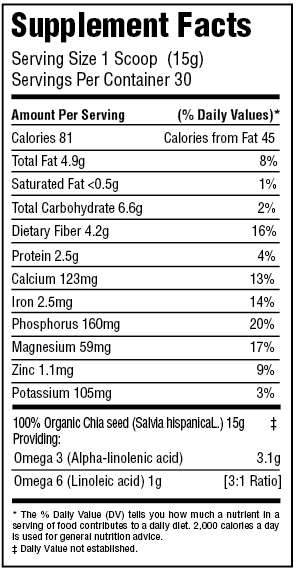 of Chia mixed in 2 oz. of water becomes the perfect egg substitute. How to enjoy Greens Plus Organic Chia Seeds: Add one scoop to water, juice, yogurt or your favorite drink. To check out our Chia Seed Cookbook, !